Bringing a radio hero to graphic novels! 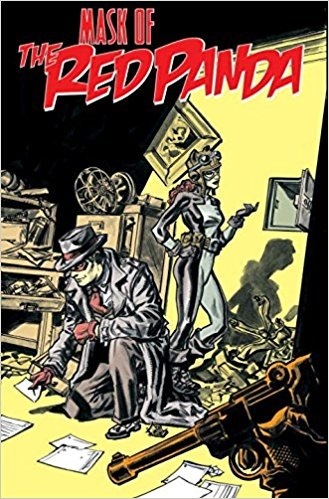 The Red Panda is a hero much like others of the pulp era. His costume is limited to a suit and hat with a bright red domino mask and matching red gauntlets. He has great skill with unarmed combat styles (especially judo) and uses a variety of devices, most of his own devising, to fight injustice. These include Static Shoes to cling to sheer surfaces, and to propel him great distances during rooftop patrol. He is a master of hypnotism, allowing him to strike fear into the hearts of the criminals he hunts. By projecting false images into the minds of others, he can extract vital information and then simply erase the crook’s memory! In reality, the Red Panda is August Fenwick, known only as "one of the city's wealthiest men." The Panda has a sidekick, The Flying Squirrel: Katya "Kit" Baxter, very much in the vein of the Green Hornet and Kato. Her costume consists of a gray catsuit and cowl, goggles, and a utility belt. She is 5 ft. 6, in her early 20's, has red hair and brown eyes. Like a real flying squirrel, she uses fabric from wrist to hip to glide about the rooftops. She has a short temper, and is prone to using her fists to make criminals talk! I really liked this new Pulp character. I will say that some of the magical parts of the story are a bit much, but overall the character is strong. This is the first volume of the Red Panda I have read, but I look forward to more!